If there’s one thing I’ve learned in all of my years as a wife and mother, it’s that meal planning can save a ton of money. This is especially obvious as a family grows. Whenever I have failed to meal plan, we end up eating out way too often, which is detrimental to our waistlines and our budget. 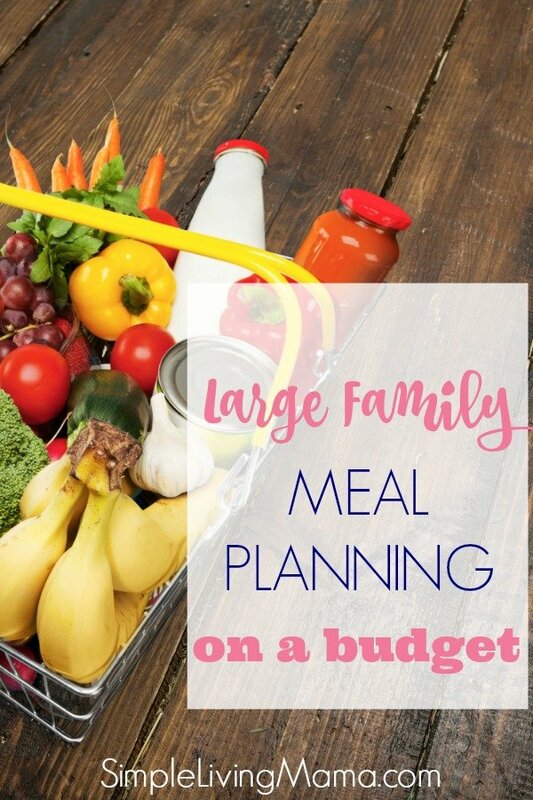 Large family meal planning helps me stick to a budget and helps me get these kids fed relatively healthy food. How in the world is it possible to not break the bank when feeding a large family? It’s making a budget and sticking with it. Even if that means you walk around the store with a calculator and add up every item you put in the cart. I’ve been doing that the last several months and have been able to stick to my budget of $150 a week for our family of eight. Of course, your budget may look differently than ours. Some weeks we have more money to work with, and some weeks we have less. I keep a running list of easy breakfast and quick and frugal lunch ideas that I make sure we have the ingredients for with each shopping trip. I plan out our dinners and try to stick to frugal meal planning even when I’m short on time. It was imperative that I learned how to plan frugal meals, and then turn those meals into meals that could feed a large family. When I’m in a really tough spot, I’ll reach for my $75 one week meal plan to pull us through. Those meals are tried and true AND cheap. Since moving to Alabama I have discovered ALDI! Y’all, this place is awesome and has already saved us a ton of money on groceries. If you’re trying to feed a large family, this grocery store is so helpful! I do occasionally share our meal plans! I have also done a lot of monthly meal planning and once a month grocery shopping. In my eBook, The Ultimate Guide to Once a Month Grocery Shopping, I lay out my master list of meals, and my master grocery shopping list for our large family. It’s also helpful to keep a frugal food shopping list when preparing your meal plans. A meal plan is only as good as the food you can prepare with it. We all want to feed our families healthy food. Be sure to check out my simple living recipe box for lots of delicious recipes!